Several global leaders had higher favourable votes than Narendra Modi but their net score was offset due to higher proportion of unfavourable votes. Bharatiya Janata Party President Amit Shah and the media have been hailing Prime Minister Modi as the 3rd most popular leader of the world, after the release of Gallup International’s opinion poll on global leaders. 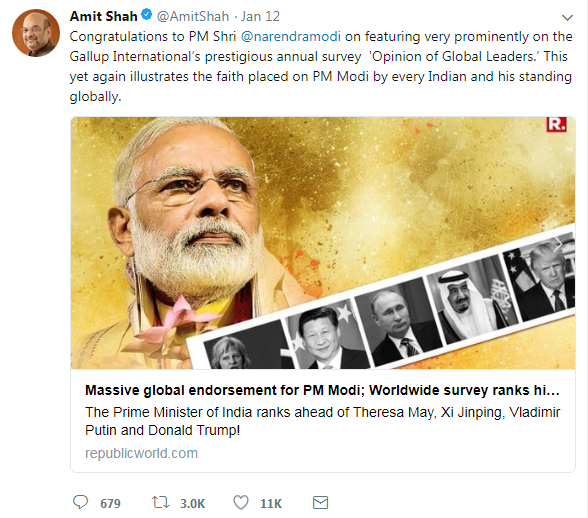 Shah tweeted that the ranking reflects the faith Indians and the world have in Modi and the transformation his government has brought about. BOOM answers key questions on what the poll is all about and what it says and does not. 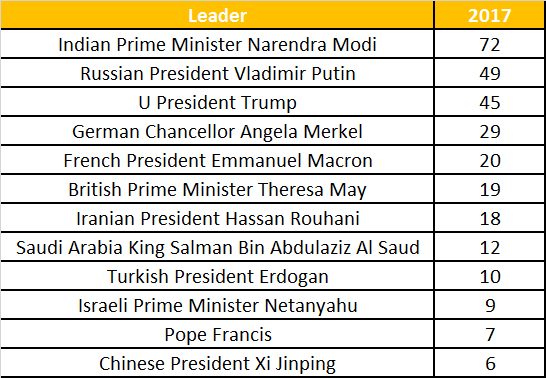 Is Narendra Modi the 3rd most popular leader in the world? Yes, according to Gallup International’s Annual Survey of Global Leaders. German Chancellor Angela Merkel stood first followed by French President Immanuel Macron. Pope Francis who is a religious and global leader is ahead of all the political leaders in terms of favourability. Gallup International is a global association that conducts market research and regular opinion polls across the globe. In 2015, the survey ranked Narendra Modi as the 5th most popular leader of the world with a net score of 4. The survey aims to find the favourability enjoyed by leaders on a global level and rank them accordingly. In 2017, the survey was done in 55 countries with a sample of around 1000 in each country. How many people participated in the poll? In 2017, a total of 53,769 persons were interviewed from 55 countries – around 1000 from each country. They were interviewed in person or over phone or email. In 2015, the sample size was 63,796 with persons from 69 countries. 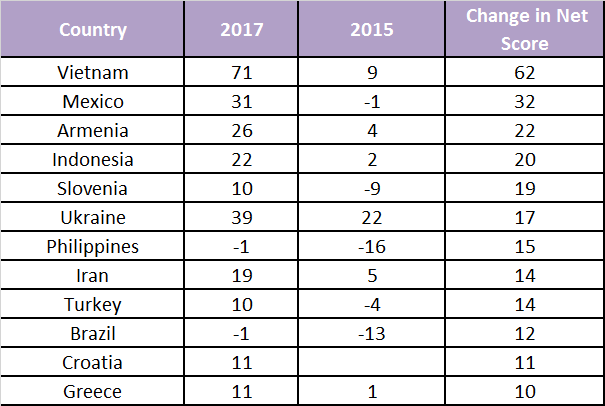 The reason for the decrease in number of participant countries and sample size in 2017 is not clarified in the report. The profile of the interviewees is not clear. BOOM is waiting for a response from Gallup International. What were the interviewees asked? They were asked if they had a favourable / unfavourable opinion regarding a particular leader. The net score was arrived at by subtracting the percentage of non-favourable votes from that of favourable votes. How was PM Narendra Modi rated? In 2017, 30% of the sample favoured Narendra Modi, while 22% had an unfavourable opinion, leading to a net score of 8. Leaders like Angela Merkel, Emmanuel Macron, Vladimir Putin, Theresa May, Xi Jinping and Donald Trump enjoy higher support than Modi. However, leaving the first two, the rest of the leaders’ net score was offset by the higher proportion of unfavourable votes they got. 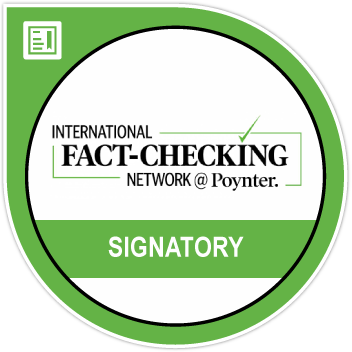 This could be due to the fact that their countries play a more visible role in international politics and are hence likely to gather more unfavourable opinion by voters who are impacted by their policies. For example, Putin who enjoys the support of 43% was also found to be voted down by 40%, thus leading to a net score of 3. This is still seen as a significant increase by Gallup International as the Russian strongman has improved his net score from -10 to 3. Similarly, while Trump received favourable votes from 31%, people who voted against him stood at a massive 58%, thus pulling down his score to -27. According to Gallup International, Trump is the only political leader where a majority hold an unfavourable view of him. This is no surprise considering the negative press Trump has attracted both within and outside the country. On the other side, Modi has got a lot of favourable opinion in the Indian subcontinent with 69% of respondents in Afghanistan and 51% in Bangladesh voting in his favour. However, the net score (favourable minus unfavourable) of Modi in Bangladesh has seen a huge drop from 50 in 2015 to 13 in 2017. In 2015, 24% favoured Modi while 20% had an unfavourable opinion, leading to a net score of 4. Which countries love Modi? Which does not? The survey result also showed country wise popularity for each leader. 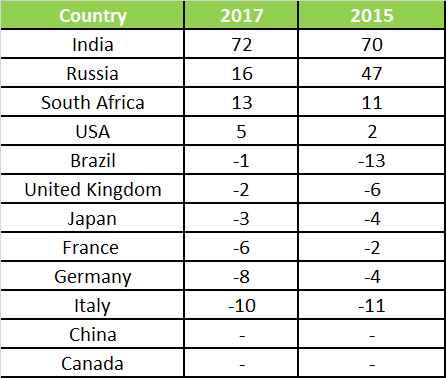 In some countries, favourability towards Modi saw a major shift. The report does not elaborate on the reasons for the shift in favourability towards each leader in different countries. How did India vote for other leaders? 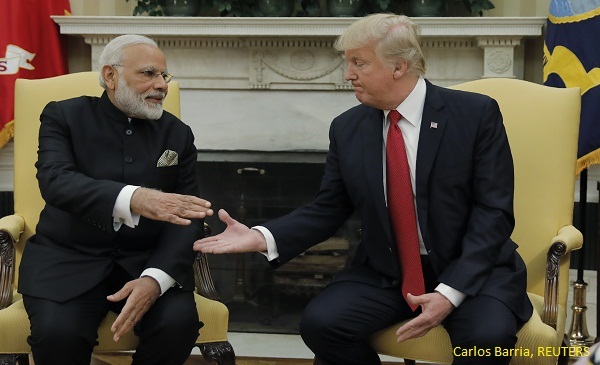 After Narendra Modi, India considers Russian President Putin followed by US President Trump as most favourable.